In the early hours of 29th May, 1892, Baha’u’llah, the prophet founder of the Bahá’í Faith, passed away. At 3am each year (4am with clocks adjusted for British summer time) Bahá’ís around the globe commemorate this event. In North-East England we have a tradition of doing so near St Mary’s Lighthouse along the coastline at Whitley Bay. This allows us, weather permitting, to witness the sun rising over the North Sea shortly after our programme of commemoration. 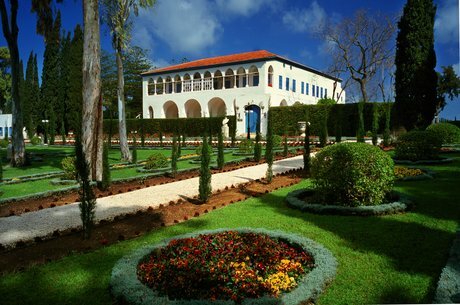 For a short photographic journey through the life of Bahá’u’lláh I recommend this site. Bahá’u’lláh had implied that His passing was close for some time prior to Him contracting a fever on the evening of 7th May 1892. During the weeks of resting that began, Bahá’u’lláh received several guests and encouraged His followers to be hold fast to unity and be steadfast in their obedience to the Light of God’s Laws. Mansion of Bahjí from the southeast gardens. © Bahá’í International Community. It was clear that Bahá’u’lláh was expecting His earthly life to come to an end. On the 21st day of His fever, at the age of 75, on the 29th May, eight hours after sunset, Bahá’u’lláh passed away. Bahá’ís refer to this event as the Ascension of Bahá’u’lláh, the moment His reality ascended to the worlds of the Spirit. 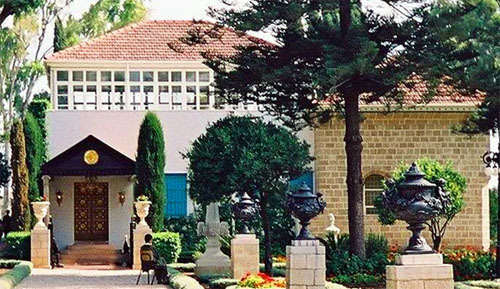 Baháu’lláh’s remains are still buried next to the Mansion House of Bahji, in the shrine shown below. This Shrine is a place of pilgrimage for Bahá’ís and we also face toward it when saying a particular daily prayer. In order that the community may remain united Bahá’u’lláh made it clear in a tablet that His son, ‘Abdu’l-Bahá, was to be the central guiding figure for the Bahá’ís after His own passing. 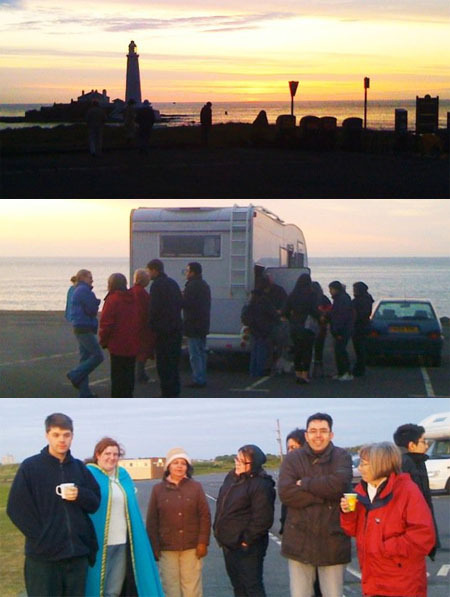 Here in the North-East around 20 of us gathered near St. Mary’s Lighthouse shortly before 3:45am to say some prayers, read some of Bahá’u’lláh’s Writings and remind ourselves ofsome of the detail surrounding the event in 1892. We came from as far south away as Durham and Chester-le-Street for the event. In Newcastle we have a Baha’i Centre but we cannot use it for public events at 4am so we encourage people to attend this coastal commemoration. Many Baha’i prefer to stay at home, of course, and remember the event in privacy, and warmth. St. Mary’s Lighthouse was itself decommissioned in 1984, so the dim dawning light of the sun was all that was lighting us when our programme started. We started with The Tablet of Visitation, a fairly long prayer generally reserved for special occasions, read in Polish by our enthusiastic Polish Baha’i, Pawel. We ended with the English version about 20 minutes later, by which time the sky was beginning to herald the start of a new day and the dawn light was stronger than the light of a cloudy day. Regular and very much appreciated attendees of these occasions are a couple called Ladan and Jeff who, along with their children, usually come with their campervan and a bar-b-que and then very kindly offer drinks and breakfast to everybody. Their bar-b-que is almost as welcome for the heat it gives off as it is for the food it cooks!After the programme it is almost a tradition for some of us to wander down to the lighthouse and quietly walk around the rocks there, but access to the lighthouse is conditional on the tides and this year the tide was high and the path to lighthouse was underwater. Below are a few more pictures of Baháí’ís and their friends or family at the event (the people are small silhouettes in the top one). Thank you for the picture of the 7 Bahais taken away by the Iranian government. I think this is done by God’s will. They will be protected. I can’t explain, perhaps if one says the Tablet of Ahmad several times every night, they can understand. In any case I don’t really know….anything, only what I feel, and there will be something about this matter in 2011. God will protect them, of course we are all sure of this, but there is something more in this matter. Anyway I made a copy of your photo for my computer screen to think about.